Five Beijing Olympians have had their positive tests for new drug Cera confirmed after analysis of their 'B' samples, says the Press Association. 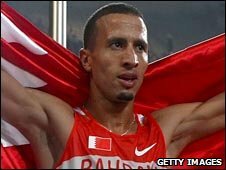 The five include Bahrain's 1500m gold medal winner Rashid Ramzi plus Italian cyclist Davide Rebellin who won silver. German cyclist Stefan Schumacher, Greek 20km walker Athanasia Tsoumeleka and Croatian 800m runner Vanja Perisic are the other Olympians to be found guilty. But Dominican Republic weightlifter Yudelquis Contreras has been cleared. All of the guilty five now face bans and being stripped of any medals after the confirmation of their failed second tests. Schumacher is already serving a ban after testing positive for Cera during last summer's Tour de France. The shamed group were initially found guilty in April after the International Olympic Committee (IOC) re-tested Beijing samples for the hormone Cera. The IOC decided to re-test 948 samples from Beijing after new tests for Cera and insulin became available. Cera is an advanced version of the endurance-enhancing hormone EPO. Ramzi, who used to compete for his native Morocco and still trains there, won Bahrain's first ever Olympic medal in Beijing last August. The 28-year-old also completed the 800m/1500m double at the 2005 World Championships in Helsinki and won a 1500m silver at the 2007 Worlds in Osaka. Rebellin, celebrated his 37th birthday by finishing second behind Spain's Samuel Sanchez in the road race at the Olympics.